This Saturday night EBU European junior middleweight champion, Sergio ‘El Nino’ Garcia fights outside of Spain for the first time to defend the belt he won just one fight ago against unbeaten, British rising star, Ted ‘The Big Cheese’ Cheeseman, at the O2 Arena in London. ‘‘This is a great opportunity for us and for boxing. We’re going to put on a show. ‘‘It’s great to be headlining a bill just around the corner from where I grew up…Once you win a European title there’s only one other step after that and when you turn pro your goal is to become a world champion…If I win this fight, and I’m highly confident I will after watching my opponent’s fights and studying him, then I’m in line for a world title shot. I’m not gonna take anything away from my opponent but…he’s not a crazy punching like Kerman Lejerraga who stopped Bradley Skeete, he’s only got 13 KOs in his 28 – He’s not fought world beaters. ‘El Nino’ became the European champion last September when he scored a dominant decision victory over 27-1, Maxime Beaussire but despite an impressive looking record of 28-0 (13KOs), the Spaniard’s resume of opponents leaves a lot to be desired, especially when compared to the quality of opponents Cheeseman has fought in almost half the amount of fights. Thirteen of Garcia’s opponents had a losing record heading into the fight. 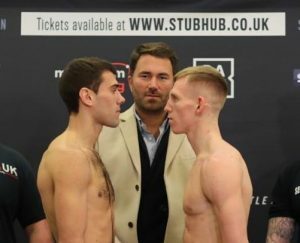 In 2018 both boxers fought three times but where Sergio went the distance with 8-6-2, Jeffrey Rosales, 9-21-5, Giorgi Kerdikoshvili and the aforementioned Beaussire; Ted started the year with a 12-round decision over gatekeeper, Carson Jones before stopping an unbeaten Paul Upton in four, and ending his year with a unanimous decision win over Asinia Byfield to claim the British 154lb title. It’s this experience and the quality of opposition faced that puts the Londoner in as a heavy favourite heading into the weekend. ‘‘I’m not gonna pretend that it’s not been frustrating with Jake ‘No-Balls’ keep pulling out. It’s been frustrating. He called me out in June, he’s been sitting on the bench injured since. Then we were meant to fight last October, he lost his balls, followed through in his trousers, pulled out in October. Then we were meant to fight December, what happened? Why didn’t you turn up in December? ‘‘Whatever happens in the fight I push through and get the win. I’m not taking this fight lightly…You shouldn’t wanna fight me unless I’m 100 percent? Craig goes on about pulling out, what he doesn’t realise is I haven’t pulled out and gone somewhere else and got a pay check.’’ Jake Ball, 12-1 (9KOs), said on Thursday, ‘‘He’s fought, he’s been paid. I’ve gone a year without getting paid now so I’ve pulled out due to injury. Not due to not wanting to fight Craig. There’s no man in the light heavyweight division, let alone Craig Richards, who I would pull out of a fight with cos I’m scared of him. I’m scared of no man. Words were also said again between the two in an intense stare down as both men weighed in today.